Featuring one of the most modern and technologically advanced PFOA-free coatings available, our ulti.. 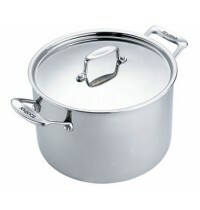 The 30cm 3–ply Stainless Steel Shallow Casserole is a truly versatile pan and is ideal for many di.. The Chef’s Pan is a fantastically versatile pan, use it to sauté, make sauces, and even stir-fry. .. Stylish designs coupled with superb cooking results are key to making cooking with 3-ply stainless s..
3-ply stainless steel for even heat distribution. Deep sides ideal for poaching, braising and sautéi.. The secret of Fusion 5 is in its construction. It is manufactured using three lay.. Cast stainless steel handle – stay cool longer The rim design allows.. Cast stainless steel handle – stay cool longer The rim design allows f.. Cast stainless steel handle – stay cool longer The r.. The Original easy clean Bake-O-Glide™ Oven Liner, superior, reusable, non-stick – smoother, stronger..
A cheeky alternative to a classic butcher's diagram, now in black on cream. The pig is tasty from..